Christchurch (/ˈkraɪstʃɜːrtʃ/) is a town and borough on the south coast of England. The town adjoins Bournemouth in the west and the New Forest lies to the east. Historically in the county of Hampshire, it became part of the administrative county of Dorset in the 1974 reorganisation of local government. Covering an area of 19.5 square miles (51 km2), Christchurch had a 2013 population of 48,368, making it the fourth-most populous town in Dorset, close behind Weymouth which has a population of 54,539. 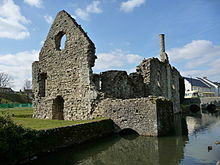 Founded in the seventh century at the confluence of the rivers Avon and Stour which flow into Christchurch Harbour, the town was originally named Twynham but became known as Christchurch following the construction of the priory in 1094. The town developed into an important trading port, and was fortified in the 9th century. Further defences were added in the 12th century with the construction of a castle, which was destroyed during the English Civil War by the Parliamentarian Army. During the 18th and 19th centuries smuggling flourished in Christchurch and became one of the town's most lucrative industries. The town was heavily fortified during the Second World War as a precaution against an expected invasion and in 1940 an Airspeed factory was established on the town's airfield which manufactured aircraft for the Royal Air Force. The town's harbour, beaches, nature reserves and historically important buildings have made Christchurch a popular tourist destination attracting some 1.5 million visitors a year. Bournemouth Airport, an international airport which handles approximately 800,000 passengers a year, is located within the borough boundary at Hurn. The airport's industrial park contains a number of aerospace and engineering businesses and is one of the largest employment sites in Dorset. Christchurch is a popular destination for retirees, and has one of the oldest populations in the country, with 30 per cent of residents aged over 65. Christchurch was founded in approximately AD 650 by missionaries sent to Wessex by St Birinus, the first Bishop of Dorchester (Oxfordshire). They settled on a stretch of raised land between the rivers Avon and Stour which carried people and their wares to and from market settlements such as Blandford and Old Sarum (near modern Salisbury). The harbour became one of the most important in Saxon England as it was easily reached from the continent and boats could travel up the river Avon to Salisbury. The town appears in the Anglo-Saxon Chronicle entry of 901 as Tweoxneam (Twynham) from Old English betweoxn (between) and ēam (rivers). In around 890 AD, Alfred the Great considered Twynham to be of such strategic importance that, with the threat of invasion by the Danes, he made it a burh and defensive walls were erected around the town. In 1094 a chief minister of King William II, Ranulf Flambard, then Dean of Twynham, began the building of a priory on the site of the original mission church. Soon after the construction of the priory the town became known as Christchurch. The railway came to Christchurch in 1847 although the nearest station, Christchurch Road, was at Holmsley and passengers were taken the rest of the way by omnibus. In 1862 a new station was built in the town close to where it stands today and was served by a branch line from Ringwood. 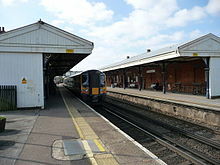 Christchurch joined the mainline in 1883, and a third station had to be built. Christchurch, and in particular Mudeford, had been enjoying a modest tourist trade since King George III had patronised the town in the 1790s but the arrival of the railways made Christchurch accessible to more potential visitors. A power station was built in Christchurch in 1903 to power the public trams. The excess generated was sufficient to light the town, and it was added to the national grid in 1940. The Fisher Aviation Company began to provide flights from fields at the eastern end of Somerford Road in 1930, and by 1933 the company had flown over 19,000 passengers. In 1934, they obtained permission to establish an aerodrome on the site which became known as Christchurch Airfield. During the Second World War an Airspeed factory was built on the airfield, and began manufacturing aircraft for the RAF; the USAAF Ninth Air Force established a base there in 1944. A second aerodrome opened at Hurn in 1944 which became Bournemouth Airport. In 1940, with the German 6th Army at Cherbourg, Christchurch was fortified against an expected invasion: the construction of pillboxes, gun emplacements and tank traps in and around the town, made Christchurch an "anti-tank island". Between 1941 and 1942 Donald Bailey developed the Bailey bridge at the Military Engineering Experimental Establishment at Christchurch Barracks. Christchurch is a local government district which has borough status. 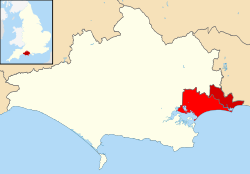 It is the smallest of Dorset County Council's six districts and one of the smallest boroughs in England by population. 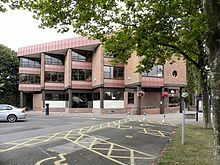 The district was formed by the merger of the Municipal Borough of Christchurch with part of Ringwood and Fordingbridge Rural District in 1974. Since then it has been part of the non-metropolitan county of Dorset. It has some large rural areas including Bournemouth International Airport and the parishes of Burton and Hurn. For local elections the borough is divided into 11 wards  containing 24 councillors. Elections take place every four years; the last election took place in 2015 resulting in the Conservatives retaining overall control with 21 seats. The Mayor of Christchurch for 2015–2016 was Independent councillor Frederick F T Neale and the Deputy Mayor was Trish Jameson (Conservative). In existence since at least 1297, Christchurch's Office of Mayor is now mainly a ceremonial role with little power. The Council Leader is Ray Nottage who has served as a Conservative councillor since 2007. Christchurch is represented by a single parliamentary constituency in the House of Commons. The seat was created in 1983 from parts of the Christchurch and Lymington, North Dorset and New Forest constituencies. It had been held by Robert Adley (Conservative) since its creation until his death in 1993. At the by-election Diana Maddock (Liberal Democrat) was elected with a swing of 35.4%, one of the largest-ever swings against a sitting party. The seat was retaken by Conservative candidate Christopher Chope in 1997, and retained in 2001 and 2005. In the 2010 general election Chope retained his seat with a considerable majority of 15,410 and 56.4% of the vote, making Christchurch one of the safest Conservative constituencies in the country. The Liberal Democrats won 25.3% of the vote, Labour 9.8% and the UK Independence Party 8.5%. Christchurch is part of the South West England constituency for elections to the European Parliament. Christchurch is the most easterly coastal town of the administrative county of Dorset, and it lies within the historic county of Hampshire. The town abuts Bournemouth to the west and is approximately 9 miles (14 km) east of Poole, 20 miles (32 km) west of Southampton, 23 miles (37 km) south of Salisbury. 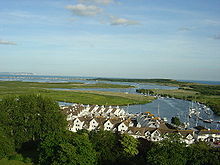 The town centre lies between the rivers Avon and Stour which flow directly into Christchurch Harbour. The borough boundaries stretch to Hurn Forest in the north encompassing Bournemouth Airport and eastwards along the coast as far as Walkford. The River Stour forms a natural boundary to the west; the estuary and harbour form the southern boundary. Stanpit Marsh is a 65-hectare (160-acre) nature reserve situated just below the confluence of the Rivers Avon and Stour. During the 18th century it was notorious for smugglers landing tobacco and rum in the narrow channels of Christchurch Harbour. It contains areas of salt marsh and freshwater marsh with reed beds and is home to grazing horses, rare birds, and 14 species of rare or endangered plants. It was designated as a Local Nature Reserve in 1964, and a Site of Special Scientific Interest in 1986. To the north of Christchurch is St Catherine's Hill, the highest part of the borough at 53 metres (174 ft) above sea level. This hill is the most southerly of a chain of three hills, some 3 miles (4.8 km) long with 35-hectare (86-acre) area of heathland and coniferous forest. The New Forest, Christchurch Priory, Hengistbury Head, Avon Valley, Christchurch Bay, The Solent and The Needles of the Isle of Wight can be seen from viewpoints on the east side of the Hill. Stour Valley way, Poole Bay and the Isle of Purbeck can be viewed from the south-west side of the Hill. Due to its commanding views, St. Catherine's Hill has been in use since prehistoric times as a look-out area and beacon and in more recent years served as a military training ground. The hill is home to protected and rare wildlife species, including the Dartford warbler, nightjar, and the sand lizard. The geology of the borough is unremarkable; the bedrock is mainly composed of sand with patches of clay to the east and west, and superficial deposits (drift) of sand and gravel cover the entire area. The extraction of sand and gravel for construction purposes is carried out in the borough, and the opening of more sites is planned. Christchurch lies at the centre of a green belt region that extends into the wider surrounding counties. It is in place to reduce urban sprawl, prevent the towns in the South East Dorset conurbation from further convergence, protect the identity of outlying communities, and preserve nearby countryside. This is achieved by restricting inappropriate development within the designated areas, and imposing stricter conditions on permitted building. The area is 3,477 hectares (34.77 km2; 13.42 sq mi) (2010) in size, and lies mainly to the north of the district, with portions surrounding the fringes of the Christchurch/Highcliffe-on-Sea urban area. Suburbs also excluded are Jumpers Common, the built up area of Burton, as well as Bournemouth Airport, with the rest of the borough including the rural portions and hamlets in the Hurn and Burton parishes being 'washed over' by the green belt. Landscape features and greenfield facilities within include the rivers Stour, Moors, Avon and their floodplains, Christchurch Priory, Chapel Lane solar farm, Blackwater and St Catherine's hills, Hurn Forest, Stanpit Marsh, Mudeford Spit, and the Adventure Wonderland theme park. The New Forest National Park in Hampshire borders the green belt to the east of the borough in Burton parish. Between 2000 and 2007 the total Gross Value Added (GVA) of the borough grew by 37% from £552 million to £757 million. The biggest contributor to the local economy through the period 2000–2007 was the transport and communication sector which in 2007 brought in £145 million GVA; £64 million more than in 2000. The sector which saw the largest growth during that period however, was metals and engineering which increased by 140%. The food, textiles and wood industries experienced the largest negative change at −42% whereas the electronics industry experienced the biggest fall with £16.2 million less than seven years previous. An aircraft manufacturing industry was established in the town with the construction of an Airspeed factory at Christchurch Airfield in 1942. In 1948 the factory became part of de Havilland and manufactured a wide range of aircraft such as the Vampire, Sea Venom and Sea Vixen. In the 1950s, Bournemouth Airport, a former RAF base situated on the outskirts of borough boundaries at Hurn, also became heavily involved in aircraft production after Vickers Armstrong—which later became the British Aircraft Corporation (BAC)—established a factory at the airport. Although the de Havilland factory closed down in 1962 and aircraft manufacturing at Bournemouth Airport ceased by the late 1970s, the aircraft and engineering industries remained important to the local economy. The BAC works at Bournemouth Airport were converted into a 80-hectare (200-acre) industrial estate which has become one of the largest employment sites in the county with over 140 businesses and a working population of some 2,000 people. The town has a number of smaller trading estates including: Airfield Way Industrial Estate, Sea Vixen Trading Estate, Silver Business Park, Hughes Business Park, Priory Park and Somerford Road, all situated on the old Christchurch Airfield; Fairmile/Avon Trading Park, once the old railway yard; and Groveley Road and Stony Lane. Bournemouth Airport is among the busiest international airports in the country and is an important economic generator for the region. Owned and operated by Manchester Airports Group, the airport handles 800,000 passengers annually and supports around 900 full-time equivalent jobs which contribute more than £24 million to the local economy. Between 2007 and 2010 the airport underwent a £45 million upgrade which included the construction of a new departure terminal. Other major employers in Christchurch include: BAE Systems, Bournemouth Aviation Services Company (BASCO), Beagle Aerospace, Bournemouth International Airport Ltd, Channel Express, College of Air Traffic Control, Data Track Process Instruments, European Aviation, FR Aviation, Honeywell, Reid Steel, Revvo Castor Company, Sainsbury's, Siemens VAI and SELEX Communications. The town's High Street contains 48 shops with 61,847 square feet (5,745.8 m2) of retail space. The addition of the Saxon Square shopping precinct in 1982 added a further 41,748 square feet (3,878.5 m2) of shop floor to the town centre—an increase of 67.5%. The combined number of shops and floor space makes Christchurch the fifth largest shopping centre in Dorset. Christchurch attracts some 837,000 staying visitors and 792,000 day visitors each year and tourism generates £76,000,000 for the local economy. Although important to the local economy with spending generating over £53,000,000 GVA, Christchurch is not so heavily dependent on tourism as some of its neighbours. Tourism's contribution to the local economy is about 9% compared to 18% for Weymouth and Portland, 15% for Purbeck and 12% for Bournemouth. Visitor accommodation consists of 11 caravan and camping parks and some 900 bed spaces in eight hotels and 75 guest houses and bed and breakfast establishments. Christchurch has two infant schools, two junior schools, five primary schools (combined infant and junior) and three secondary schools. The secondary schools are, in order of size: Twynham School (1,515 pupils), Highcliffe School (1,347 pupils) and the Grange School (637 pupils). The secondary schools share a sixth form with the three sites providing different courses. Schools in Christchurch fall under the jurisdiction of Dorset County Council. From the 2008 General Certificate of Secondary Education (GCSE) results, Dorset was ranked 32nd out of 148 local authorities in England based on the percentage of pupils attaining at least five A* to C grades at GCSE level including maths and English. Twynham was the best performing school in Christchurch in 2009: 67% of pupils gained five or more GCSEs at A* to C grade including maths and English compared to the national average of 49.8%. Highcliffe achieved 62% but the Grange School was less successful: only 40% of pupils achieved five or more A* to C grade results. Twynham was also the best performing school for A-level results with an average score of 727.8 points per student, slightly below the national average of 739.3. Highcliffe School School students averaged 618.4 points and the Grange School 571.9 points. Christchurch has been the birthplace and home of notable people including Benjamin Ferrey, a renowned architect who was one of the earliest members of the Royal Institute of British Architects, of which he was twice Vice-President, and a Royal Gold Medallist in 1870. Ferrey's works include the restorations of Christchurch Priory and Wells Cathedral. Edmund Lyons was a Royal Navy admiral and diplomat who was born and lived in the parish of Burton. He served in the Crimean War and was elevated to the peerage in 1856 as Baron Lyons, of Christchurch in the County of Southampton. Gustavus Brander, curator at the British Museum and governor of the Bank of England lived at Priory House which he had built in 1777 in the grounds of Christchurch Priory. Prince Louis Phillipe, the future King of France took refuge there during the Napoleonic Wars. Robert Southey, writer, poet and Poet Laureate; lived in Burton between 1797 and 1799. Many other writers and poets of the day visited him there including his brother in law, poet Samuel Coleridge, and the Scottish novelist and poet Sir Walter Scott. John Stuart, 3rd Earl of Bute, Prime Minister 1762–63, amateur botanist and one of the founders of Royal Botanic Gardens, Kew; built a mansion, High Cliff House, on his Christchurch estate close to the cliff top in 1773. The area is now known as Highcliffe. 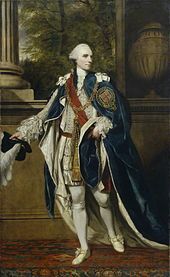 Charles Stuart, 1st Baron Stuart de Rothesay, diplomat and grandson of John Stuart, 3rd Earl of Bute; built Highcliffe Castle a grand, romantic style mansion house on the site of his grandfather's house. Sir George Rose, Member of Parliament for Christchurch and close friend and advisor to the Prime Minister William Pitt, built a home, 'Sandhills', at Mudeford. His other great friend, King George III often visited, helping to promote Christchurch as a tourist destination. Sandhills was home to George Rose's two sons: politician and diplomat Sir George Henry Rose, and poet William Rose, who both served as Members of Parliament for Christchurch. Field Marshal Hugh Rose, 1st Baron Strathnairn, son of Sir George Henry Rose spent time living at the family home. James Clark (1825-1890), horticulturist and early genetic hybridist who specialised in breeding new potato varieties. He was born in Wick near Tuckton (then a part of Christchurch) and lived his whole life in the Christchurch area. In response to the Irish Potato Famine he developed the Magnum Bonum potato, which is widely acknowledged as the first disease resistant variety. Magnum Bonum was trialled by entrepreneurial horticulturalist Shirley Hibberd and subsequently sold to Sutton's Seeds, who introduced it in 1876. Clark later developed many other varieties of potato, of which Epicure is still grown. Sir Donald Bailey, a civil engineer, developed the Bailey bridge while he worked in Christchurch during the Second World War. Bailey lived in Christchurch after he retired in 1966 until his death in 1985. Former England football international and Liverpool player Jamie Redknapp attended Twynham School when his father, Harry Redknapp, managed A.F.C. Bournemouth. Another footballer, retired Arsenal and Scotland goalkeeper Bob Wilson, has a home near the town centre. ^ "Census 2001". Office for National Statistics. 2001. Retrieved 6 September 2010. 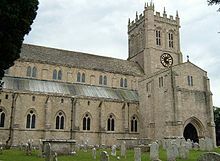 ^ "Christchurch Area Profile - Dorset Statistics". apps.geowessex.com. Retrieved 20 November 2016. ^ a b Stannard (1999) p. 1. ^ Stannard (1999) p. 208. ^ Hill, Rumble (1996) p. 107 & 198. ^ Stannard (1999) p. 3. ^ a b Taylor (1994) p. 1. ^ Hodges (2003) p. 6. ^ a b c Moxey (1997) pp. 89–90. ^ a b Stannard (1999) pp. 135–136. ^ Stannard (1999) pp. 210–211. ^ a b c Hodges (2003) p. 5. ^ Stannard (1999) p. 178. ^ Moxey (1997) p. 92. ^ a b Powell (1995) pp. 46–47. ^ Stannard (1999) p. 193. ^ Moxey (1997) pp. 82–83. ^ Stannard (1999) p. 197. ^ Taylor (1994) p. 3. ^ Newman (1998) p. 34. ^ a b Hodges (2003) p. 116. ^ Newman (2009) p. 39. ^ Moxey (1997) p. 82. ^ Stannard (1999) pp. 226–228. ^ Stannard (1999) pp. 228–229. ^ Hodges (2003) pp. 51 & 90. ^ Hodges (2003) pp. 88–94. ^ a b Stannard (1999) p. 241. ^ Taylor (1994) plate no.123. ^ Newman (1998) p. 8 & 25. ^ Newman (2009) p. 8. ^ a b "A Vision of Britain Through Time". University of Portsmouth. 2009. Retrieved 30 July 2010. ^ Newman (2009) pp. 8–10. ^ a b Taylor (1994) intro. ^ "UK Authorities" (PDF). Office for National Statistics. 2009. Retrieved 17 September 2010. ^ "Local election results 2015 in full". The Guardian. 15 May 2015. Retrieved 24 May 2015. ^ "Elections for the North Highcliffe & Walkford ward". dorsetforyou.com. Retrieved 23 June 2015. ^ "The Mayor of Christchurch". Dorset County Council. Retrieved 16 September 2010. ^ "History of the Mayor". Dorset County Council. Retrieved 16 September 2010. ^ "Christchurch Borough councillors". Dorset County Council. Retrieved 16 September 2010. ^ Robyn Powell (23 May 2010). "A History of By-election upsets". The Daily Telegraph. Retrieved 2 August 2010. ^ "2010 Election – Live Coverage: Christchurch". BBC News. 2010. Retrieved 2 August 2010. ^ "Christchurch: Constituency". The Guardian. 2010. Retrieved 13 September 2010. ^ "Local MPs and MEPs". Dorset County Council. 2010. Retrieved 30 December 2010. ^ Dorset For You (26 February 2018). "Government approves unitary councils for Dorset" (Press release). Dorset: Dorset County Council. Retrieved 28 February 2018. ^ Taylor (1994) p. 6. ^ a b "Christchurch Harbour". Dorset County Council. Retrieved 21 September 2010. ^ Hoodless (2005) p. 24. ^ Stannard (1999) pp. 177–178. ^ "Friends of Stanpit Marsh". Friends of Stanpit Marsh. Retrieved 9 August 2010. ^ "SSSI Citation: Christchurch Harbour" (PDF). Natural England. Archived from the original (PDF) on 6 April 2012. Retrieved 22 June 2010. ^ a b "St. Catherine's Hill". Dorset County Council. Retrieved 31 October 2010. ^ Christchurch Countryside Service. "Dorset For You – St. Catherine's Hill". Dorset County Council. Retrieved 17 August 2010. ^ "Geology of Britain Viewer". British Geological Survey. Archived from the original on 27 July 2011. Retrieved 17 July 2010. ^ Bob Jolliffe (22 November 2008). "Villagers Fear Gravel Blight". Bournemouth Daily Echo. Retrieved 2 August 2010. ^ a b "Weather Averages Christchurch, England". Msn.com. 2010. Retrieved 18 June 2010. ^ "UK 1971–2000 averages". Met Office. 2008. Archived from the original on 5 July 2009. Retrieved 18 June 2010. ^ a b c "CHRISTCHURCH AND EAST DORSET LOCAL PLAN Part 1 - Core Strategy" (PDF). www.dorsetforyou.gov.uk. ^ "Dorset For You: Christchurch". Dorset County Council. 2001. Retrieved 6 September 2010. ^ a b c "Christchurch Census Town Profile" (PDF). Dorset County Council. 2005. Retrieved 22 June 2010. ^ "South East Dorset Strategy" (PDF). Bournemouth Poole and Dorset Strategic Partnership. November 2005. p. 2. Retrieved 1 June 2011. ^ a b "The State of Christchurch: A Profile of Christchurch and Its Residents (5th Edition)". Christchurch Borough Council. March 2008. p. 23. Archived from the original (PDF) on 8 March 2012. Retrieved 28 June 2010. ^ a b "The State of Christchurch: A Profile of Christchurch and Its Residents (5th Edition)". Christchurch Borough Council. March 2008. p. 6. Archived from the original (PDF) on 8 March 2012. Retrieved 28 June 2010. ^ "The State of Christchurch: A Profile of Christchurch and Its Residents (5th Edition)". Christchurch Borough Council. March 2008. p. 35. Archived from the original (PDF) on 8 March 2012. Retrieved 28 June 2010. ^ "The State of Christchurch: A Profile of Christchurch and Its Residents (5th Edition)". Christchurch Borough Council. March 2008. p. 38. Archived from the original (PDF) on 8 March 2012. Retrieved 28 June 2010. ^ a b "How will Dorset cope with ageing population?". Bournemouth Daily Echo. 6 August 2010. Retrieved 7 December 2010. ^ "Census 2001: Top 10". Office for National Statistics. 2002. Retrieved 21 September 2010. ^ Maxine Frith (4 July 2003). "Know Your Neighbour". The Independent. Retrieved 21 September 2010. ^ "The State of Christchurch: A Profile of Christchurch and Its Residents (5th Edition)". Christchurch Borough Council. March 2008. pp. 43–45. Archived from the original (PDF) on 8 March 2012. Retrieved 28 June 2010. ^ "Christchurch Census Town Profile" (PDF). Dorset County Council. 2005. p. 6. Retrieved 19 June 2010. ^ a b "Christchurch Census Town Profile" (PDF). Dorset County Council. 2005. p. 4. Retrieved 19 June 2010. ^ "Christchurch Census Town Profile" (PDF). Dorset County Council. 2005. p. 19. Retrieved 19 June 2010. ^ "Dorset for You-Key Facts on Housing". Dorset County Council. 2009. Retrieved 21 December 2010. ^ "The State of Christchurch: A Profile of Christchurch and Its Residents (5th Edition)". Christchurch Borough Council. March 2008. p. 5. Archived from the original (PDF) on 8 March 2012. Retrieved 31 December 2010. ^ a b "The State of Christchurch: A Profile of Christchurch and Its Residents (5th Edition)". Christchurch Borough Council. March 2008. p. 10. Archived from the original (PDF) on 8 March 2012. Retrieved 28 June 2010. ^ "The State of Christchurch: A Profile of Christchurch and Its Residents (5th Edition)". Christchurch Borough Council. March 2008. pp. 55–63. Archived from the original (PDF) on 8 March 2012. Retrieved 6 August 2010. ^ a b Dale Jayne; Gray Anne; Wicks John (March 2009). "Sectoral Change in the Bournemouth, Dorset and Poole Sub-regional Economy". Bournemouth County Council & Dorset County Council. p. 23. Retrieved 30 November 2010. ^ Dale Jayne; Gray Anne; Wicks John (March 2009). "Sectoral Change in the Bournemouth, Dorset and Poole Sub-regional Economy" (PDF). Bournemouth County Council & Dorset County Council. p. 9. Retrieved 30 November 2010. ^ a b Dale Jayne; Gray Anne; Wicks John (March 2009). "Sectoral Change in the Bournemouth, Dorset and Poole Sub-regional Economy" (PDF). Bournemouth County Council & Dorset County Council. p. 20. Retrieved 30 November 2010. ^ Hodges (2003) p. 127. ^ "Our History". Bournemouth Airport. 2010. Retrieved 3 January 2010. ^ "Estate". Aviation Park. 2010. Retrieved 3 January 2010. ^ "Home". Aviation Park. 2010. Retrieved 3 January 2010. ^ a b "Dorset for You: Christchurch". Dorset County Council. Retrieved 18 August 2010. ^ "Economic development in Christchurch". Dorset for You. Dorset County Council. Retrieved 9 February 2011. ^ "About Us and Our Group". Bournemouth Airport. 2010. Retrieved 3 January 2010. ^ "New Bournemouth Airport terminal opens". BBC News. 9 June 2010. Retrieved 7 December 2010. ^ a b c "Detailed Retail Information". Dorset County Council. 2005. Archived from the original on 23 March 2012. Retrieved 30 November 2010. ^ "The State of Christchurch: A Profile of Christchurch and Its Residents (5th Edition)". Christchurch Borough Council. March 2008. p. 9. Archived from the original (PDF) on 8 March 2012. Retrieved 28 June 2010. ^ "Research Matters" (PDF). Dorset County Council. p. 2. Retrieved 30 November 2010. ^ "The State of Christchurch: A Profile of Christchurch and Its Residents (5th Edition)". Christchurch Borough Council. March 2008. p. 12. Archived from the original (PDF) on 8 March 2012. Retrieved 28 June 2010. ^ Hodges (2003) p. 23. ^ Hodges (2003) pp. 23–24. ^ "French market". Bournemouth Daily Echo. 14 June 2010. Retrieved 31 December 2010. ^ "Foodie heaven – The 10th Christchurch Food and Wine Festival". Dorset Echo. 28 April 2009. Retrieved 19 December 2010. ^ "History". Christchurch Food and Wine Festival. 2010. Retrieved 21 September 2010. ^ "Christchurch Festival information". Christchurch Festival. 2010. Retrieved 18 August 2010. ^ "The Social Season". Debrett's. 2010. Archived from the original on 18 June 2009. Retrieved 18 August 2010. ^ Newman (1998) p. 16. ^ Hodges (2003) p. 8. ^ "Stompin on the Quomps – Christchurch waterside jazz festival". Practical Boat Owner. 7 August 2010. Retrieved 31 December 2010. ^ Stannard (1999) pp. 220–224. ^ "Red House Museum". Dorset County Council. Retrieved 19 September 2010. ^ "The SSE Heritage Collection - SSE". sseheritage.org.uk. ^ Taylor (1994) p. 2. ^ a b Hodges (2003) p. 17. ^ Hodges (2003) pp. 13–24. ^ Hodges (2003) p. 19. ^ Newman (1998) p. 53. ^ Newman (1998) p. 18. ^ Taylor (1994) plate no.83. ^ Moxey (1997) p. 90. ^ Hodges (2003) p. 31. ^ "Listed buildings online: Town Bridge". Heritage Gateway. Retrieved 2 November 2010. ^ "Listed buildings online: Waterloo Bridge". Heritage Gateway. Retrieved 2 November 2010. ^ "Waterloo Bridge New Pedestrian Walkway". Society of Chief Architects of Local Authorities. Retrieved 2 November 2010. ^ a b c Moxey (1997) p. 87. ^ Powell (1995) p. 33. ^ Moxey (1997) p. 89. ^ David Eels. "Christchurch Castle". Christchurch Local History Society. Archived from the original on 15 May 2011. Retrieved 12 August 2010. ^ Stannard (1999) p. 141. ^ a b Hodges (2003) p. 9. ^ Hinde (1996) p. 125. ^ Stannard (1999) p. 4. ^ Distance of mill stream flow taken from Ordnance Survey map of Christchurch, which shows the outflow into the Stour. ^ "Listed buildings online: Place Mill Bridge". Heritage Gateway. Retrieved 2 November 2010. ^ "Listed Buildings Online: Highcliffe Castle". Heritage Gateway. Retrieved 29 December 2010. ^ a b c Keith Miller (2 November 2002). "Making the grade: Highcliffe House". The Daily Telegraph. Retrieved 29 December 2010. ^ "Home: Highcliffe Castle". Highcliffe Castle. Retrieved 29 December 2010. ^ "Visitor Information". Highcliffe Castle. Retrieved 31 October 2010. ^ "Hurn Bridge". Christchurch F.C. 2010. Retrieved 18 September 2010. ^ "History". Christchurch F.C. 2010. Retrieved 18 September 2010. ^ a b "Hurn Bridge Sports Club". Christchurch Cricket Club. 2010. Retrieved 18 September 2010. ^ "Christchurch C.C News". Christchurch Cricket Club. 2009. Retrieved 18 September 2010. ^ "Riversmeet Leisure Centre". Dorset County Council. 2010. Retrieved 18 September 2010. ^ "Christchurch Bowling Club". BowlsClub.Org. Retrieved 18 September 2010. ^ Hodges (2003) p. 120. ^ "Christchurch Water Sports 2010" (PDF). Christchurch Borough Council. 2010. Retrieved 28 December 2010. ^ "The State of Christchurch: A Profile of Christchurch and Its Residents (5th Edition)". Christchurch Borough Council. March 2008. p. 143. Archived from the original (PDF) on 8 March 2012. Retrieved 21 August 2010. ^ Christopher Stocks (9 July 2009). "Dorset: There's Nowhere I'd Rather Be". The Daily Telegraph. Retrieved 21 August 2010. ^ "The State of Christchurch: A Profile of Christchurch and Its Residents (5th Edition)". Christchurch Borough Council. March 2008. p. 138. Archived from the original (PDF) on 8 March 2012. Retrieved 21 August 2010. ^ "Trains". Dorset County Council. Retrieved 22 August 2010. ^ "Network Mapyear". South West Trains. 2010. Retrieved 22 August 2010. ^ "Air Passengers by Type and Nat of Operator 2009" (PDF). Civil Aviation Authority. 2010. Retrieved 7 December 2010. ^ "Complete Destination List". Bournemouth Airport. 2010. Retrieved 22 August 2010. ^ "United Ferries". Bournemouth Boating Services. 2004. Retrieved 22 August 2010. ^ "Self Drive Boat Hire". Bournemouth Boating Services. 2004. Retrieved 22 August 2010. ^ "Wick Ferry". Bournemouth Boating Services. 2004. Retrieved 22 August 2010. ^ "Wick Ferry". QUT Digital Collections. Retrieved 31 January 2018. ^ Powell, Mike (1995). Christchurch Harbour. Briar Park Business Centre, Stour Road, Christchurch: Natula Publications. p. 89. ISBN 1-897887-07-8. ^ "Town factsheets and profiles: Christchurch". Dorset County Council. Retrieved 26 July 2010. ^ "How different areas performed". BBC News. 15 January 2009. Retrieved 11 September 2010. ^ a b "Achievement and attainment tables 2009: KS4 results". Department for Children, Schools and Families. 2009. Retrieved 11 September 2010. ^ a b "Achievement and attainment tables 2009: GCE and equivalent results". Department for Children, Schools and Families. 2009. Retrieved 11 September 2010. ^ Fraser Donachie. "Benjamin Ferrey". Christchurch Local History Society. Archived from the original on 1 November 2010. Retrieved 12 August 2010. ^ Taylor (1994) plate no.146. ^ Moxey (1997) p. 79. ^ Powell (1995) p. 52. ^ Wilson, Alan (1995). The Story of the Potato Through Illustrated Varieties. ISBN 0-9520973-1-1. ^ "Jamie and Louise Redknapp visits his old school". Bournemouth Daily Echo. 19 August 2010. Retrieved 19 August 2010. ^ "OBE honour for former goalkeeper". BBC News. 29 December 2007. Retrieved 2 August 2010. ^ "Christchurch Twinning Association". Dorset County Council. 2009. Retrieved 15 September 2010. Hill, David; Rumble, Alexander R. (1996). The defence of Wessex: the Burghal Hidage and Anglo-Saxon fortifications. Manchester University Press. ISBN 978-0-7190-3218-9. Hinde, Thomas, ed. (1996). The Domesday Book: England's Heritage, Then and Now. Godalming: Coombe Books. ISBN 978-1-873535-60-8. Hodges, Michael A (2003). Christchurch: The Golden Years. Tiverton: Dorset Books. ISBN 978-1-871164-38-1. Hoodless, W.A (2005). Hengistbury Head: The Whole Story. Poole: Poole Historical Trust. ISBN 978-1-873535-60-8. Moxey, Sarah (1997). Avon Valley Footpath Guide. Wellington: Halsgrove. ISBN 978-1-874448-26-6. Newman, Sue (2009). Christchurch Through Time. Stroud: Amberley Publications. ISBN 978-1-84868-358-7. Newman, Sue (1998). Images of England: Christchurch. Stroud: Tempus Publishing Limited. ISBN 0-7524-1050-4. Powell, Mike (1995). Christchurch Harbour. Christchurch: Natula Publications. ISBN 1-897887-07-8. Stannard, Michael (1999). The Makers of Christchurch: A Thousand Year story. Christchurch: Natula Publications. ISBN 978-1-897887-22-6. Taylor, Christine (1994). Christchurch: A Pictorial History. Chichester: Phillimore and Co. Ltd. ISBN 0-85033-901-4. Wikimedia Commons has media related to Christchurch, Dorset.